I started The Ancient Wisdom Project because I was getting frustrated with most of the advice the popular personal development/lifestyle design bloggers were espousing. I decided that ancient wisdom traditions would have time-tested practices and philosophies that would be better that anything some 30-year old would have to say about making your life better and more meaningful. While I still hold the position that if you had to choose between a blogger and an ancient wisdom tradition as your source of life advice that you should pick the latter, it’s unlikely that you will need to do so. So I thought I’d write a blog post that gives a short description of their philosophies, my experience with following their advice, and which ancient wisdom tradition would complement or improve their advice and philosophies. Before I get into it though, please remember that my summaries of these bloggers views necessarily leave out much of the nuance and finer points of what they believe, so don’t intepret what I have to say about them as being the definitive guide to their blogs. Tim is considered the father of the modern lifestyle-design/personal development genre. In his debut book, The Four Hour Work Week, Tim described an aspirational vision of what your life could be if you were able to free up your time by ditching the desk job and starting a “muse,” a business that generates passive income that also takes up a relatively smalle percentage of your work week (4 hours). Tim has expanded his blog to focus on other life-hacks such as optimizing your fitness routine and learning the art of skill acquisitition (cooking, language learning, etc.). He has also delved into the world of podcasting, and has done a fantastic job of interviewing some very interesting people. The big take-away from his site is that we spend much our lives doing things we don’t want to do, and doing it inefficiently, such that it causes us significant stress and anxiety. By learning a few hacks or tricks, we can minimize the negative and free up time for things we actually want to do, thus leading to a happy and satisfying life. After I left the Navy, I had no idea what I was going to do with my life. 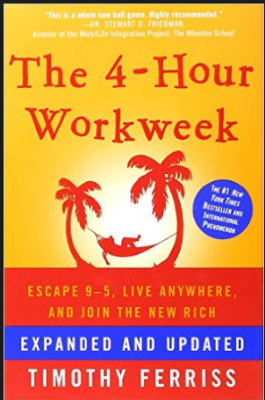 I picked up a copy of The Four Hour Work Week and was hooked. Of course I didn’t want a desk job. I wanted to live a compelling life in which money flowed into my bank account effortlessly while I drank alcoholic beverages on a Thai beach somewhere. So I delved into the world of online business and exotic travel. I took a job teaching English in Cairo to support myself while I tried to figure out the whole passive income thing. After leaving Egypt in the middle of the Arab spring, I still hadn’t successfully generated any significant revenue for my online business so I moved to Portland, Oregon with my girlfrend and kept working on it. After several years, I still hadn’t gotten it off the ground and I let the project die. There are a couple of problems I had with Tim’s advice. One, creating a passive income business is way harder than he makes it seems. Certainly the rewards seem great if you can make it happen, but building a passive income businesss is still building a business. It takes a lot of work. That’s just the practical side. The second problem is that the passive-income business was a way to distract myself from my core problem: what to do with my life. It was a sort of semi-plausible fantasy that allowed me avoid commiting to any single path that may have uncertain outcomes. I suspect that many of Tim Ferriss’ readers are also using the passive-income entrepreneurship model as an escapist fantasy or distraction from real life. They think that they’ll have time to focus on what they really want once they get the pesky job out of the way. Unfortunately, that day is unlikely to come so you’ll push it off indefinitely. If it does come, you’re faced with the same problems. Unlike the 4HWW, Catholicism doesn’t let you avoid tough questions. If you attend Mass like I did and read up on the basic tenets of the religion, you are forced to confront your broken nature and examine whether or not you are living the life God intended you to. No priest will ever tell you, “Don’t worry about how you’re serving others until you have a successful passive income business.” The Church does its best to meet you where you are and teaches you to do the best you can within your current circumstances. During my own experiment, I realized how fundamentally selfish I am, in the sense that I spend 99% of my time thinking about myself. Mass was a ritualized way of reminding me that my flaws are great, but not damning, and that good deeds can help combat (if not eliminate) those flaws. It was irrelevant whether or not I “believed” in Jesus or the dogma. What mattered was that the Church presented issues that cut to the core of what it means to live a good life and didn’t shy away from the hard things. It’s fun to think about all the traveling you’re going to do once you’re rich, but it won’t help you address that feeling of emptiness deep in your soul. If you are trying to become a lifestyle entrepreneur, I would round out Tim’s tactical advice with deeper Catholic teachings about life. Lifestyle is just window dressing. It’s your actual life that matters. Ignatian spirituality offers a different wisdom on vocation. It counsels us to discover our personal calling by aligning our gifts and aspirations with what we see as the deepest needs of our world. For people of faith, that convergence is where the Spirit of God invites them to a unique path. Prayerful reflection opens us to those fundamental desires and to compassion for the world. An authentic calling goes beyond personal fulfillment to a concern for justice that asks about fulfilling the needs of others, even if they are strangers. Ramit Sethi is the author of the I Will Teach You To Be Rich blog which started off as a personal finance site but grew over time to encompass all manners of topics that contribute to living what Ramit calls a “rich life.” His advice encompasses relationships, careers, business, diet, and fitness and he applies a psychology/systems mindset to these areas. Once we learn to identify these invisible scripts, we can make dramatic progress in areas that previously caused us grief. A few years ago I moved to Washington, DC without a job or apartment. I lived at a hostel and was quite discouraged by the job search. A friend recommended looking into IWT and I was blown away by how useful his career advice was. He offered non-conventional advice, e.g. don’t shotgun resumes, about identifying jobs you want to know more about, applying, interviewing, and negotiating. For example, in job interviews, he teaches you to look for the “question behind the question.” Instead of just winging a job interview by directly answering questions, you should use it as an opportunity to present a compelling narrative about yourself that sets you apart from other candidates. The question about your greatest weakness is not about lying and saying you work too hard. The interviewer wants to know if you are self-aware enough to identify specific weaknesses and more importantly, whether or not you have ways to correct them or mitigate them. I find almost all of Ramit’s specific advice to be excellent. He does his research and makes sure he tests out his advice with many many student guinea pigs before he offers the course to the public. …I’m staking a claim on demanding MORE instead of LESS. If your focus is on cutting back, this site probably isn’t right for you. But if you want more — more travel, more success, more opportunities, more fun — I can help. But the additive approach is just one side of the coin. Frankly, trying to pursure more in all these areas of your life will likely leave you exhausted and frustrated. It needs to be balanced out with a subtractive approach to personal improvement. Epicurus was a 4th century BCE philosopher who created the hedonist philosophy we call Epicureanism. Hedonists beileve that life is about maximizing pleasure and minimizing pain. While we may associate modern Epicureans with fancy restaurants and luxury resorts, the original Epicureans emphasized something far more important, the attainment of ataraxia, or freedom from stress or worry. I spent my Epicurean month trying to minimize variety in my diet and reduce the amount of time I watched TV. Simply by doing those few things, I filled my time with more pleasurable activites (reading, hanging out with friends, etc.). Removing the negative is an equally effective strategy for improving your life. It doesn’t take any resources to stop doing things. You don’t need to buy anything or free up time. You just stop. It’s accessible to everyone. Of course, we will always need to take positive or additive actions to make improvements to our lives, but it’s worth just as much to examine whether or not those pursuits are worth it, and see if there is anything we can stop doing that would also lead to positive results. If you are going to follow Ramit’s advice, take some time to consider whether or not there are things you can subtract that will also yield positive results. Cal Newport is the author of Study Hacks, a blog originally focused on contrarian advice for students but now dedicated to helping people craft a compelling career and work life by implementing “deep work” techniques to become so good they can’t ignore you. Instead of following the non-sensical and ineffective advice to follow your passion, Cal argues that passions are cultivated and earned. Very few people have pre-existing passions, and people that are passionate about their work only became so as they became better at it. Passions follows skills, not the other way around. Cal believes there is no magic bullet of “finding” your passion. Once you have a rare and valuable skill, you can cash that in for things that matter you. To develop a rare and valuable skill, he advocates techniques like workflow engineering, ditching social media, and boredom meditation. If you find the “hard work” part of Cal’s philosophy discouraging, Cal reminds you that your dream lifestyle is worth the effort. If you are able to focus on the skills that matter for a writer, for example, you may be able to take those three month retreats into the woods to write the next great American novel. If you are a corporate warrior and are able to avoid the unimportant distractions that inevitably arise in a mega-corp, you may be rewarded with generous salary increases and the authority and resources to execute your business ideas. If you are an aspiring academic, becoming great in your field will allow you to research what you want to research on your own terms. The rewards are as great as the path is difficult and Cal does an excellent job of not only demonstrating what a compelling, passionate professional life looks like, he gives you concrete steps to getting there. Passion comes after you put in the hard work to become excellent at something valuable, not before. In other words, what you do for a living is much less important than how you do it. I stumbled on Cal’s blog around the time I started my job in government human capital consulting. It was incredibly refreshing to find someone challenging the conventional advice that all you need to do is “find” your passion, especially since I was entering the most boring industry ever. Knowing that it was not a problem that I was bored was quite a revelation. I simply had to get good enough in the industry to develop career capital and cash that in for things I want. Unforunately, it took me a while to figure out what was important in the consulting world. I thought that I should focus on skills like making fancy powerpoints and mastering Excel. Those are important, but worthless if you don’t figure out the number one thing that consulting companies care about: clients. If you can develop good relationships with the clients directly, and get them to rave about you and your work, your company will bend over backwards to keep you. I eventually developed a good direct relatioship with a client who was going to throw more money on a contract that I was working on and leveraged that opportunity to my advantage. My company didn’t have anyone that had both the relationship with the client and the skills necessary to do the work. I knew that, so I proposed to my boss that I instead become an independent contractor (capturing most of the billable rate) and finish out the contract for the rest of the year. My company pushed back, but I had the leverage so they caved. I doubled my income and worked only four days per week instead of the normal five. Without Cal’s advice, I would have quit the field entirely, thinking that it wasn’t “right” for me because I wasn’t passionate about it. Instead, I stuck with it, improved my skills, put up with the BS, and when the opportunity came, I made sure to cash in my career capital. Cal’s philosophy and advice is compelling and actionable, and if you are feeling blah about your professional life, I would pick up his books So Good They Can’t Ignore You and Deep Work and read through his blog. The one downside to his philosophy, however, is that it is easy to feel quite guilty when you are not getting the results you want right away. Cal is a bit of a productivity freak, and the people he profiles in his books and blog are exemplars of his philosophy. Because they are exemplars, their stories are quite neat and linear and their successes appear inevitable. Real life is far more messy. Taoism was “founded” by Chinese philosopher Lao Tzu in 4th century BCE (though historians aren’t certain) when his teachings were aggregated into the manual, the Tao Te Ching. The core idea behind Taoism is that there is a natural order or way of things (the Tao) and that we should do our best to identify what the natural order of things is, and then go with it, not against it. American/Protestant/Western Capitalist philosophies generally advocate grit, hard-work, and perserveance to dominate nature in all of its forms. In business, this would mean using all your ingenuity to create a better product that you competitors and gain market share. In the personal development space, it means fighting the darker sides of our human nature (greed, envy, sloth, etc.). With Taoism, you would never try to force yourself to do anything. There is a concept called “Wu-wei” which loosely translates to “non-action.” What this suggests is that it is often appropriate to do nothing. In western culture, if there is a problem, there is sense that we need to do something. But doing something is not always the best approach, and in fact, may actually be harmful. For example, when I attempted to start my own online business in Egypt, it was in an industry that I knew nothing about from a business perspective (travel). I figured because I liked traveling for fun, I could learn what I needed to learn as I went along. The business was a failure. While I don’t regret starting it, because it was a forced project, it was doomed to failure. Compare that to my recent experience starting my own indepndent consulting business in a field I found mind numbingly boring, government human capital consulting. I waited for a couple years before the right opportunity came up and when it did, it was very effortless to start the business. I immediately had a six figure business. I already had the skills and the customer lined up, it was just a matter of applying a little force (not forcing it) to my company to get what I wanted. Wu-wei is not always about literally doing nothing, but rather, not going against the Tao, the natural way of things. I believe that to round out Cal’s advice, you need a healthy does of Taoist thinking to keep your sanity. There is a time for deep work and getting so good they can’t ignore you, but there is also a time for not trying to progress at all, and instead, wait for opportunities to present themselves to you. I believe Study Hacks and Taoism to be quite complementary. You need both for balance. When you are crushing it at work and rapidly improving your skills, great! Keep going so long as you have energy. But when you see progress has stalled or circumstances are not quite in your favor, don’t fight it, embrace wu-wei. Being able to switch between these two modalities will serve you well and allow you take advantage of the best of eastern and western thinking in your quest to create a compelling and passionate work life. When you work with Wu Wei, you put the round peg in the round hole and the square peg in the square hole. No stress, no struggle. Egotistical Desire tries to force the round peg into the square hole and the square peg into the round hole. Cleverness tries to devise craftier ways of making pegs fit where they don’t belong. Knowledge tries to figure out why round pegs fit round holes, but not square holes. Wu Wei doesn’t try. It doesn’t think about it. It just does it. And when it does, it doesn’t appear to do much of anything. But Things Get Done. Note: Cal is a good friend of mine and generously allowed me to write a few guest posts on Study Hacks. If you haven’t already, check them out. Chris spent many years living an unconventional life. Some examples include starting an Ebay reselling business, spending four years living on a ship and volunteering in West Africa, and traveling to every country in the world (often in business class) using “travel hacking” methods. His first book, the Art of Non-Conformity, profiled many people living unconventional lives and provided a blueprint for those who wanted to do the same. The target audience was those were dissatisfied with the “normal” life path set out for them, typically college educated office drones who were bored out of their minds. Chris advocates identifying what you really want to do and then prioritizing that desire over other things that you find less important. If traveling is important to you, find ways to arrange your lifestyle to do that. This may entail making certain sacrifices (saving money by not going out to eat, for example) and eliminating distractions. But, if it’s do what you really want to do, it’s worth it. Basically, don’t feel bad about your “weird” desires. It’s okay to break from the norm, whatever that is. If you’re stuck in the cage, it’s time to smash the glass around you and crawl your way out. You don’t need anyone’s permission to climb the ladder, and you don’t need to apologize for escaping. If the sleepwalking life is the “real world” of the unremarkably average, the clear alternative is the living world of adventure. I have never explicitly followed Chris’ advice in the sense that I read his book and changed the way I did something. However, I’ve always been a sucker for trying to be a a little unconventional. I wanted to be a Navy SEAL because it was tough, prestigious, and different than what many of my classmates what I wanted to do. I went to teach English in Egypt because I loved the idea of hanging out in the Middle East and being able to tell cool stories when I got back. I started my own online business because I feared ending up in a desk job. When I ended up at a desk job, I was miserable because the work was not high paid, interesting, or prestigious. My ego depended on doing something just a little bit differently or better than what everyone else was doing. But the downside of trying to be unconventional or non-conformist is that you become too attached to your “non-conformist” identity. When you become too attached, you cut off the possibility of simply being content with your circumstances when they don’t align with your identity. I was unhappy at my day job as a consultant because I thought my life was boring, and that I needed to do something rebellious. While part of this is personality-based, much of it was simply at attatchment to my ego. I looked down on the self-satisfied “normals” who never aspired to do anything more. Little did I know that my concept of my self was highly dependent on those “normals.” Without them, I wouldn’t have anyone to define myself against! I believe the problem with Chris’ philosophy is that if you’re not careful, you can become too attached to the idea of living a non-conformist lifestyle. It’s great that he opens your eyes to new ways of trying things, but there is also something to be said about teaching yourself to become okay with your life as it is. Hinduism as a coherent philsophy and religion began to take shape between 500 and 300 BCE. While the philosophy is quite expansive, one of the central ideas is that the self (your identity, what you think of as “you”) is an illusion. It’s simply a narrative we adopt in order to help us navigate through the world. The problem occurs when you forget it is simply adopted. AONC convinces you that you need to switch from one narrative to another, from conformist to non-conformist. What Hinduism teaches is to let go of identity narratives entirely. Once you have done so, you have attained moksha, or enlightenment. In practice, most of us will never achieve enlightenment, but we can learn a thing or two from Hinduism about letting go of the ego. Hinduism matured in a time and culture where you were born into a particular role in society (the caste system) and were pretty much stuck there. If your parents were farmers, you were going to be a farmer. If your parents were soldiers, you were going to be a soldier. There was verry little social mobility. So Hinduism naturally teaches a way to cope with your situation as it is, not as you wish it could be. If you live in the US, you enjoy an unprecendented amount of options in your life. But this can backfire, and you can become dissastisfied with your current situation if it isn’t consistent with who you think you are. Hinduism advocates a few different techniques to move past the ego. One of them is to simply double down on your current identity. For example, if you are a bored government consultant, Hinduism would say to do your dharma (duty) as a consultant to the best of your ability. Don’t be worried about outcomes (raises, recognition, etc. ), simply do good work without becoming attached. Basically, think of it as a temporary role you have to play convincingly. Another technique is simply to practice a form of meditation by observing how your mind reacts to certain situations that trigger “identity reflexes.” I once got in trouble with the HR department at my job because I submitted a “controversial” article in the company newsletter. The HR head did not approve because somehow it insulted the company (I didn’t see it that way) and I became upset at how conservative and sensitive she was. When I applied a Hindu way of looking at it, I realized that I really depended on people like the conservative HR lady to fuel my own identity as a “rebel” or “provocateur.” Without people like her, I would had no identity, nothing to rebel against. While I haven’t let go of my non-conformist identity, I’m now more appreciative of my enemies. I treat my interactions with them as a sort of game in which the outcome doesn’t matter, only how well I play. Whatever your identity or role is at the moment, you can learn to simultaneously embrace it and become detached it. While you may eventually adopt another identity, it isn’t crucial that you do so if you can learn to be okay with the one you have. AONC can present you with altnerative identities for you to embrace. But Hinduism should round out the AONC philosophy by teaching you to recognize that none of it is “real” and that simply replacing one with another is not the only solution to the malaise you feel in your day-to-day life. It would be foolish to advise people to ignore a whole class of people’s advice; there is usually something to learn from everyone. The bloggers I mentioned above have some great advice for some things, but it’s very easy to become obsessed with their particular way of viewing the world. It helps to have exposure to other types of wisdom as well, in this case, ancient wisdom. Rounding out modern counsel with time-tested philosophies, practices, and wisdom can be an excellent way to navigate unique modern challenges while still implementing the insights of the experiences of billions of people over thousands of years. Finding community at … McDonalds?